In the recent decade, Pakistan has immensely flourished in the field of Information Technology. A lot of people have associated themselves with this industry. As a result, Pakistan is becoming a very popular destination for both local and foreign investments. Alibaba Group Holding Limited is the E-commerce giant in Chinese IT industry. It has certain electronic payment services, a shopping search engine and data-centric cloud computing services and all these sales services are provided through web portals. It provides extensive services of online shopping, online auction, money transfer and mobile commerce. With the help of this web-based service, Chinese manufacturers are connected with buyers all over the world. It is one of the largest internet company and world’s largest retailer facilitating 60 million companies across the globe. 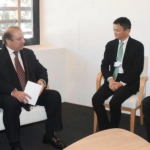 Alibaba has been closely evaluating the performance of e-commerce sector in Pakistan and now the Chairman Alibaba has shown his interest to start joint ventures with Pakistan in e-commerce sector in recent meetings with PM Nawaz Sharif during World Economic Forum in Davos. Alibaba tends to monitor the response of industry by launching some of its initial ventures. Alibaba has launched a mobile internet company named UC Web that works with the help of UC Browser. This company provides the services of mobile browsing and has acquired 25.3% market share in Pakistan. Another informal venture decided by Alibaba to be launched in Pakistan is AliExpress and it aims to work for the retail segments of the country. The training sessions and work on the necessary infrastructure of AliExpress have not yet completed and once completed, AliExpress will be launched formally which has already been able to bag 15,000 orders per day.